So if it’s Sunday it must be Dorking for the U15 As, for the third time in just a couple of months and the second weekend in succession. This time in something called the Twickenham Cup Final at Farnham, reward for winning their group in the Harlequins Cup. The first game on Sunday saw the B squad come up against Farnham B at Fowlers Wells, looking to close their season on a winning note having played mainly A sides in 2018. This they did in style with a convincing 30-10 win demonstrating their prowess when facing equivalent opposition. On to the Cup Final then, at a cold and windy Monkton Lane. With a good hour prep’ Chobham set off like a train. The kick-off was pinched as Dorking were hesitant under a high kick. Chris was through a gap in the line and was deep in to hoops territory before being brought down. Strong drives around the ruck by the forwards took play to within 5 yards before the backs then looked to break through down the left side. Play was brought to a halt as Dorking strayed offside and Chob took a short kick to the corner for a lineout. A safe catch from Matt and good body positions saw Dorking on the receiving end of their own medicine as the forwards drove them at pace back over their line and Charlie dotted down for the first points and a 5-0 lead after a couple of minutes. Dorking were in the Chob half then for the first time from the restart but their scrum was under pressure and they were forced back to halfway as Tommy stole the ball following some loose play. At the next Dorking put in Chob took a rare steal against the head and play moved back into the Dorking 25 once more. The boys were unable to force home the advantage and Dorking cleared to midfield where Jack was able to recover the bouncing ball. At the tackle the defence went off their feet however and Dorking put in a kick close to the Chob line. Just like the previous week the boys in blue pushed the drive backwards and then the big loose forward was brought down by Fin and was pinged for hanging on. Chob cleared their lines but Dorking were beginning to have a bit more possession and got themselves to the Chob 25 and won a penalty. Clearly Dorking had given up now on the drive as they opted for the penalty, only to see the ball sail wide of the upright and go for a 25 drop out. At this point Chob had to change a few positions as Dan went off with a rib injury and Callum stepped up to the front row and Aran joined the backs. After a couple of false starts Chob were able to get on the front foot once more and attack in the Dorking half. A clever grubber from Gideon had the fullback scrambling and he was met with a blue wall who carried him over his own line for a 5 yard scrum. From this platform the backs earned a penalty close in and from a quick tap Jack was able to go over near the posts after only being half tackled. Chris added the extras and it was a 12-0 lead. It was honours even for a spell as play moved slowly between the two 25s until Dorking had another penalty close in just before the whistle and managed to narrow the gap to 9 points at the break. Right from the whistle to restart Chob were able to press Dorking as they had strayed offside for the kick. A lineout followed by the backs driving through the middle led to a big blindside and when the ball was released Chris fed Adam on the wing who had the footwork to go round a forward and dive in at the corner, the lead being extended to 17-3. The ref for this match was the same as had reffed the Surrey Cup final between these two the previous weekend and he started to pick up on many of the same offences as he had over at Vandals. Chob started to get blown for offside and couldn’t create any kind of momentum as Dorking had the greater possession and territory. They in turn had reverted to their tighter 9 man approach and started to see the dividend. With Chob near their own line Dorking had a shortened line out, they opted for the quick ball to a big forward on the hoof. A penalty was conceded and from a quick tap the hoops pack had enough grunt to rumble over and reduce the deficit to 17-8. The effect of a long season and a lot of games squeezed into the final few weeks was beginning to take its toll on both sides as the half progressed. Chob lost Al to a shoulder injury, though luckily Billy and Andy were able to step up from the bench having already played for the Bs. With the timer already showing 30 minutes Dorking had another penalty near the Chob line. As on so many occasions this season the defensive line held and the ball wasn’t grounded. Dorking went wide from the resulting scrum though and were able to get over the line inches from the flag to come back to 17-13. This was two minutes into injury time, but anyone who had been at the marathon before new there would be plenty more time to come. In this final period of play Chob managed to wrest back control of the play and spent the majority of time in the Dorking half. Dorking had one opportunity to create some pressure but a missed penalty kick down the line around the Chob 25 kept them at bay, then a rushed pass in midfield gave the ball up. Chob ended the game with a drive through the centre and keeping the ball tight with pops around the fringe. 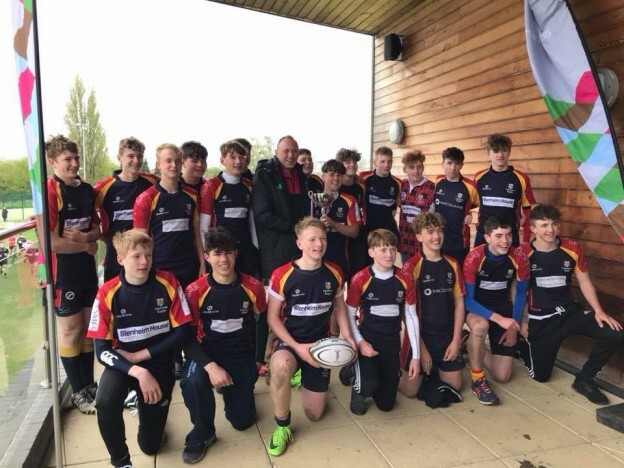 Last play was called with a Chobham lineout that was safely taken and kicked off the park thus ensuring an unbeaten 8 from 8 in competitive matches for the squad and ending the season with two bits of silverware to celebrate at the end of a long season. Squad: Jack, Adam, Doug, Fin, Harry, Chris, Gideon, Dan, Charlie, Oli, Callum, Al, Connor, Tommy, Matt, Aran, Billy, Andy.